Here is my Robinson Curriculum Review. I looked at it quite a few years ago and regret that I didn't start using it then. I started using it feeling like I had finally "home" with a curriculum. The curriculum was developed by a homeschool Dad after his wife suddenly passed away and he was left to homeschool his 6 children. I like it because it is a simple approach. It is not easy, but it is simple. 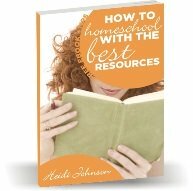 I also like the fact that there are audios and articles you can use that help you understand the philosophy and give you ideas on how to implement this curriculum in your home. The students that use the curriculum have a high level of success both in testing and in real life. You can find out all about their story, how to order the program and access to the audios and articles at Robinson Curriculum. The main drawback that I can see is that you might not want to adhere to the time constraints outlined in the curriculum or you might not want to print and bind all the books. Printing the books takes a lot of time and ink, but the forums can help guide you through that process. Although my children enjoy working independently, they do not enjoy reading for many hours a day. This curriculum worked for us for a while, but we needed more hands on material and less reading and printing. I already had lots of books collected and having to print even more just didn't work for us. My Robinson Curriculum review is that I highly recommend this self-teaching curriculum for those who have children who really like to read. After a few more months of use I have to modify this review a little. Although I like the philosophies and ideas presented in this curriculum, I still don't print the books. I have collected many books before I purchased this program, and I'm just as happy to use what I have on hand. I also do not "require" my children to sit and work for 6 hours. My teenagers do that on their own, but I don't mandate it. I found that my 7 year old HATED math flashcards, so I have adapted that program as well and do some math related activity each day, but not flashcards. It just wasn't worth it to me for him to hate learning. I guess with any curriculum you will need to adapt it to your own needs. This is how I have adapted this curriculum in our home.